This is definitely one surprising news. At home, we have replaced all light bulbs to energy saving fluorescent bulbs for two purposes - to save energy and have more efficient lighting. Was it a clever move? Read on. Energy saving light bulbs can emit levels of ultraviolet radiation sufficient to damage the skin, the Government's public health safety watchdog warned. The agency issued what it described as "precautionary advice" yesterday after measuring levels of UV light emitted by the bulbs at the request of patient groups. They have complained that they aggravate light-sensitive conditions such as the blood disease lupus, eczema and porphyria, which together affect tens of thousands of patients across the UK. 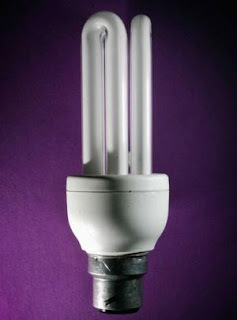 Energy saving bulbs, also called compact fluorescent lights, have been on the market for more than 20 years and come in two types – "open" with the glass coil clearly visible, and "encapsulated" where the coil is enclosed in a second layer of glass and looks more like a conventional light bulb. The research showed that one in five of the "open" bulbs emitted UV light equivalent to that experienced on "a sunny day in summer" when in very close proximity (less than one inch) to the skin, which warranted "some precaution". When the light was moved further away, beyond one foot, the UV level was below the exposure on a sunny day in winter and was "not a concern". Open bulbs should not be used where the user is closer than one foot for more than one hour a day, the agency said. Encapsulated lights with a double glass envelope did not emit significant amounts of UV light, the research found, and could be used in place of the open kind for close work. What do you think? We say, we'd still stick to fluorescent bulbs. Just be sure you get those in capsules. there's no denying the savings we get from the energy-saving bulbs. perhaps we should invest in moisturizers with high SPF? Hello Aips. Thanks for dropping by. Re fluorescent bulbs, we can't agree more. LOL @ SPF. Though that gave us an idea. We had lots left from the last summer. It gives us more reason to stock up on them. Hope you continue to visit us as we continue to improve our blog.